Owing to the positive response from prestigious clients, we have been inspired to manufacture a wide range of School & College Furniture. These products are tested as per the international standards of quality to ensure a robust and durable construction. We have special team of skilled professionals who are involved in the customization of School Desk & Chair, College Desk, School Desk, Drawing Table and many more products as per the requirements and needs of the clients. 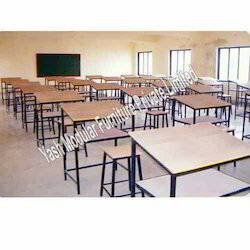 This range of products includes school desk, drawing table and computer lab furniture. We are one of the leading manufacturer of a wide variety of School Desk. Tested as per the international standards of quality, these products are quite easy to handle and install. These products are altered in design and dimensions as per the requirements and needs of our respected clients. 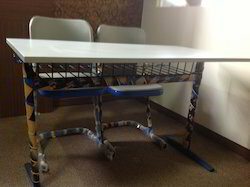 Owing to the positive response from our clients, we have started to supply them with a huge array of Drawing Table. We also have the capability to customize the size of these drawing table as per the requirements and demands of the clients. Tested as per the international standards of quality, these products are quite popular in the market. These products are specially made in a slanting style to facilitate better operation and handling while drawing. We have the expertise and experience to manufacture as huge range of College Desk. Alteration of these products as per the needs and specifications of the clients is also very popular in the market. These products are duly checked as per the international standards of quality to ensure a rugged and robust construction.